The great cathedral of Chartres is renowned the world over as a masterpiece of High Gothic architecture and for its remarkable stained glass, considered alchemical glass, and its mystical labyrinth. But the sacred foundations of this sanctuary go back to a time long before Christianity when this site was a clearing where druids worshiped a Virgo Paritura: a virgin about to give birth. This ancient meeting place, where all the druids in Gaul gathered once a year, now houses the magnificent Chartres cathedral dedicated both to the Virgin Mary, Mother of God, and to one of the most venerated Black Madonnas in Europe: Our Lady of the Pillar. Coincidence? Hardly, says Jean Markale, whose exhaustive examination of the site traces Chartres’ roots back to prehistoric times and the appeal of the Black Madonna back to the ancient widespread worship of Mother Goddesses such as Cybele and Isis. Markale contends that the mother and child depicted by the Black Madonna are descended from the image worshipped by the druids of the Virgin forever giving birth. This image is not merely a representation of maternal love--albeit of a spiritual nature. It is a theological notion of great refinement: the Virgin gives birth ceaselessly to a world, a God, and a humanity in perpetual becoming. In all traditions, the color black is synonymous with “night,” “darkness,” “death,” “chaos,” or even, to use an Eastern term, “non-existence,” which is not precisely the same thing as “death” or “chaos.” The color black is not a color, it is the absence of colors, whereas the color white brings together and synthesizes all colors. This allows us to understand the primordial dichotomy that has passed into the collective unconscious between Black and White, in the zone of white civilization, in other words that of the Indo-Europeans and Semites more or less centered around the Mediterranean. It clearly seems that the concept of the Virgin Mary, the Virgo Paritura of Chartres and other sites, may be this “Stone of the Black.” In any event this was the thought of all those who unhesitatingly depicted the Mother of Jesus with a black face, therefore recycling the well-known image of the Shulamite “burned by the sun.” The Song of Solomon takes pains to counsel the Daughters of Jerusalem, and thereby all humanity, to refrain from treating this black color as a punishment of curse. “Pay no attention to my black color, I have been burned by the sun.” Whether it is the Holy Ghost whose shadow covered Mary, or the secret Fire of the Alchemists, the result of the operation remains the same: the primal Matter turns black. But this is because when impregnated by the Spirit it can give birth to the One who will be the Light, Jesus in the evangelical scriptures, the Philosopher’s Stone in Alchemical treatises. These same treatises specify that none can discover the material Philosopher’s Stone unless he has undergone, in his own mind, the same metamorphosis. There is no longer any dichotomy between Mind and Matter, for Jesus (or the Philosopher’s Stone) is both Body and Spirit, man and God. And if the anonymous sculptors of the Middle Ages wished to give Mary this black color that has caused so much fascination, it is clearly because they had in mind the spreading of this essential message: from this apparent darkness the Light will emerge. Of course, only certain elite knew this meaning of the black goddesses, then the Black Madonnas of Christianity, but the nature of the elites is to transmit to the highest number a core concept in the form of a very simple concrete image. The Black Virgin is not a Christian creation but an adaptation to the Christian world of this archaic concept that is present in all religious or mythological traditions. In India, “in the beginning was depthless night. Then manifested the Most High, who was self-existent; he created the water and sowed his seed upon it; this produced the Golden Egg, from which was born Brahma, creator of worlds.” This myth of the original darkness is universal. ". . . this book will appeal to the serious scholar and the reader passionate about this unique cathedral; it is rich in information and ideas that can continue to be mined with each successive reading." ". 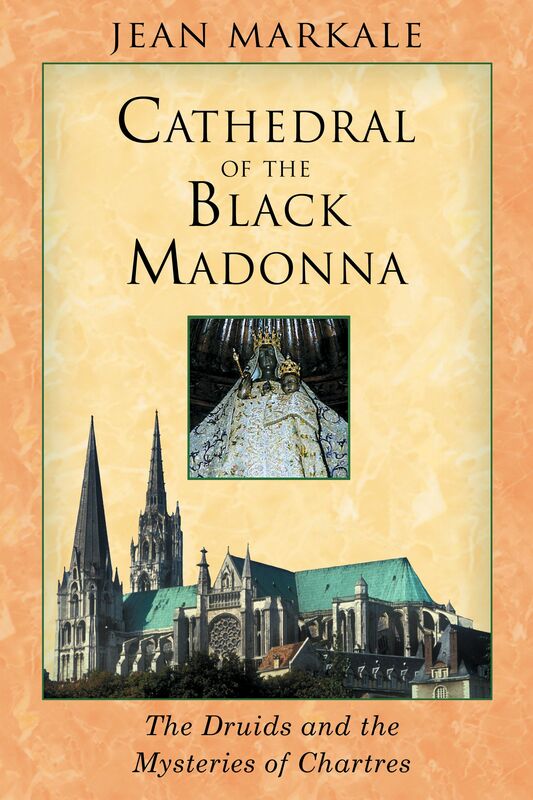 . . a comprehensive discussion of not just the Black Madonna, but of one of the most amazing cathedrals ever built." "Markale's examination traces the appeal of the Black Madonna back to ancient goddess legends and times and provides plenty of insights into Druid mysteries." "Markale's linkage of the ancient Druid theology to the Catholic theology and its Marian devotion is a cogent work of historic research and religious considerations. Forget the 'DaVinci Code' and pick up this book instead." "If you have an interest in ancient cultures, goddess worship, the sacred nature of the cathedrals and those who built them, and the path of Gnosis, there is much to love in this book. . . . Read it, put it away and read it a few months later. You will see something within it that you did not see before." " . . . author Jean Markale takes us far back to the underlying roots that flowered into the cathedral we see today."